Motorists faced delays this morning (Monday) after a bus fire between Barford and Wellesbourne. Earlier this morning the A429 was closed in both directions after a bus caught fire. 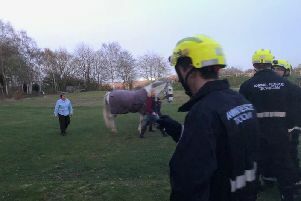 Emergency services including Warwickshire Fire and Rescue Service and Warwickshire Police attended the scene. According to a Tweet from Warwickshire Fire and Rescue service a double decker bus caught fire and Police and Highways also attended to the scene to clear oil and diesel from road. Traffic on the A429 is now starting to move but there are still delays.